This being Black History Month (in the US and Canada...Britain waits until October! ), I thought I'd dig through my notes on some of the lesser-known resources available for African-American genealogy. Don't be fooled into thinking these sources are only of use for black family history. Where there were black slaves, there were white slave masters, shippers, sellers and abolitionists, and these families, too, are all part of the horrible-yet-fascinating diaspora that is African-American history. 1867 Alabama Voter Registration database. This Reconstruction-era list of Alabama voters includes information on the race of registered voters. There are 70,000 African-American men listed here -- about half of all voters on the list. Along with name and county/precinct information, there is a section for "Native" country, though this seems to be rarely filled in. Kansas Memory African-American Collection. 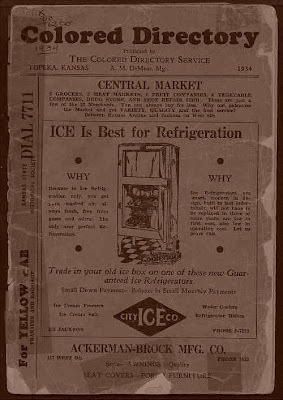 There are several hundred items of interest here, including several county censuses from the late 1800's that include the race of respondents, a 1934 Colored Directory for Topeka, and a file on African-American Cowboys. At the Minnesota State Archives, you can find the Duluth Lynchings Online Resource, with more than 2,000 pages of scanned documents from this 1920 tragedy. Their Visual Resources Database has about 1,000 African-American images. From New York State, you can find the Harlem Hellfighters WWI Muster Rolls, the first African-American regiment to participate in World War I. The West Virginia State Archives have diversified pages on African-Americans in the state. These include information on individuals, as well as broader contextual resources, like a timeline of significant events in WV black history. Some of the primary documents and behind-the-scenes events in the history of the civil rights struggle can be found at the new Library of Congress exhibit, NAACP: A Century in the Fight for Freedom. Also from the LoC, the WPA Slave Narratives, over 2,000 first person accounts of slavery, along with about 500 photos, collected by the Federal Writer's Project in the 1930's. There is also an in-depth history available online: Afro-Americans in New Jersey: a short history. Don't forget to also check for your family history at Ancestry.com and NewspaperArchive. These are subscription databases, but they are among the most powerful research tools available for looking into family roots..